Of Muscat. It is made up of low rise white coloured buildings with flat roofs and they seem to have an abundance of Arabic arches and turrets. There are also loads of minarets scattered around, visibly more than anywhere else we have visited. Ashore as per usual we were dropped off at a market called a souk. There were great smells of burning myrrh frankincense etc it was awesome. A very conservative country we brought local clothing so as to not upset the locals and they really appreciated our efforts and it gave me and Wendy another chance to dress up! Small gifts were then purchased. Speaking to locals that spoke English they said that there was not much tourism here most foreigners were oil industry workers. So we went to the Hyatt hotel for the afternoon where we enjoyed more luxury around a nice pool with some new people to chat with. This time it was American oil workers who were OK. By now we have become accustomed to the assumption that Dan and Josie are our children. It gives us another charade to have some fun with telling people how we can't control them and watching their reaction. All a good laugh. 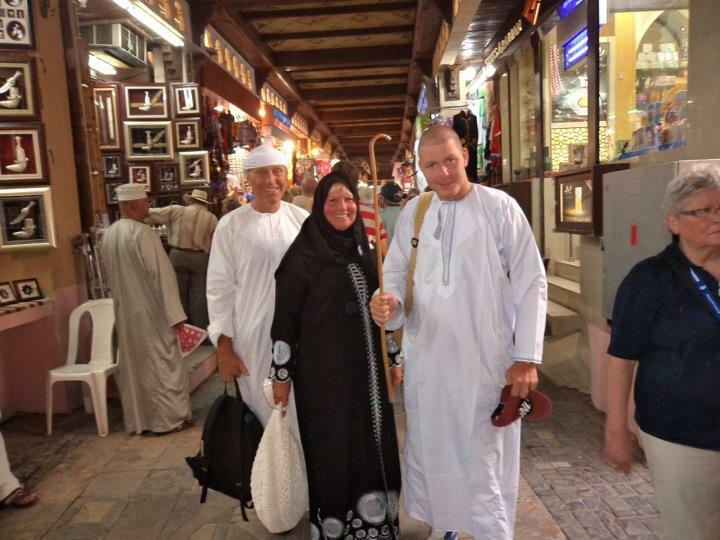 All through at the Hyatt then we set off by can to a quieter part of town just happily mixing with the locals Wendy in a full burka and me in my white sheiks outfit. The people from Oman are also a friendly lot always making the effort to speak to you and try out their English, to be honest there is very little English spoke here but less Omani spoken by us. The return the the ship was a bit of a drama. We were dropped off by the taxi at the harbour gates due to security. It's still about a mile from there to the ship and your not allowed to walk. So how do you get to the ship? So we set off walking but didn't get far before we were accosted by an Arab claiming to be the harbour master, he looked quite irate but his lack of English and our lack of Arabic caused sufficient exasperation for him to give us a lift back to the ship and continue his remonstrations with the ship Security. Thereafter we had a quiet evening aboard concluding with the Chelsea fa cup match 5 - 2 not bad and Torres scoring 2. Infanta Mary, Joseph and the sheepherd?